Check out all of my chocolate recipes here! I use chocolate a lot. Like a lot, a lot. 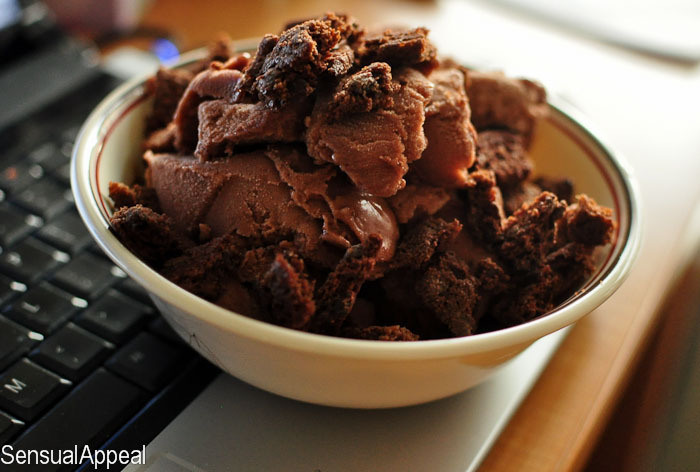 Yes, I am a huge fan of chocolate. And thank you for continuing with the entries for my Arctic Zero giveaway. If you win that one, your freezer will welcome 8 pints and 8 bars of this delicious low calorie and high protein frozen dessert. Pictured above is the chocolate peanut butter Arctic Zero flavor topped with two Enjoy Life’s double chocolate crunch cookies. Which are the topic of today’s post. Well not those specific cookies but just the crunch cookies in general. 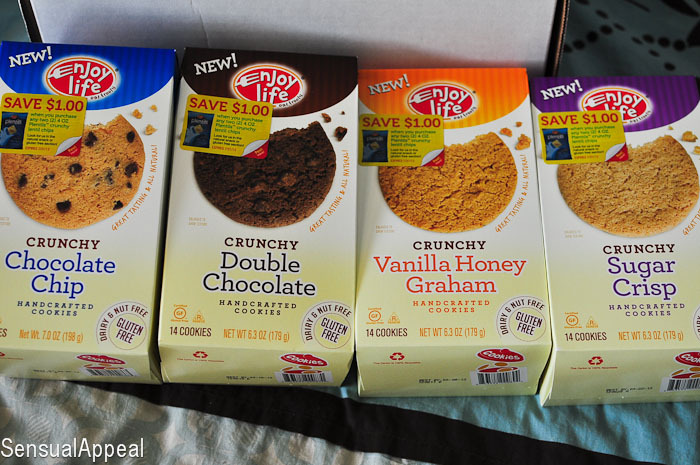 I got to try out Enjoy Life Foods crunchy cookies. Truth be told, I haven’t had cookies in a long time. Not the packaged kind. If I’m to have cookies, I’ll bake them myself or I’ll go for ones that are freshly baked in a bakery or whatever. Which isn’t often anyway. It used to be often, but I’ve tamed myself when it comes to processed and packaged foods. However, these cookies don’t necessarily make me concerned or guilty when eating them (as opposed to bakery goods or other store bought goods). I got to try four of their available flavors of the “crunchy” collection: chocolate chip, double chocolate, vanilla honey graham, and sugar crisp. I am totally almost embarrassed to admit that I chowed down on the box of chocolate chip cookies in one day. Yeah, I was in a food sugar frenzy that day. Don’t judge me, everyone has those okayyy? The following day, I was right back on track! I swear. So the chocolate chip cookies were good, I’m a fan of chocolate chip cookies overall and these did not disappoint. 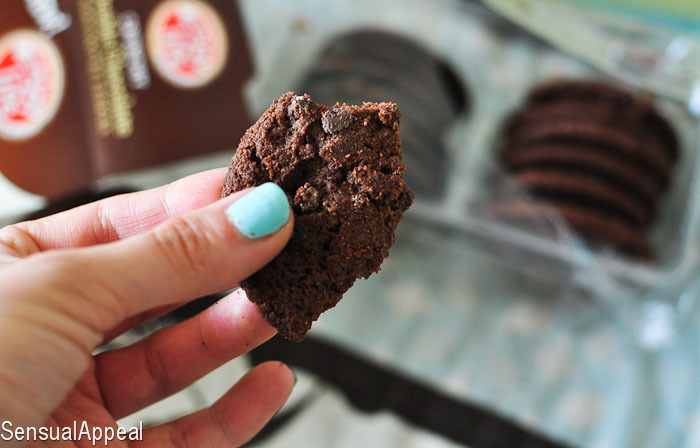 I have been using the double chocolate cookies as toppings for yogurt or Arctic Zero as you’ve seen above as well as noshing on them by themselves. They are only 110 calories per 2 cookies so that’s a pretty good stat in my opinion 🙂 I also like the vanilla honey graham ones but I am saving them to use for a future recipe as a crust or topping, like a cheesecake or something. I don’t know yet, but I have some options in mind, so stay tuned for that. Lastly, I am not a fan of sugar cookies personally and I never have been but my roommate liked those. Anyway, all in all these are yummy gluten-free and allergen-free cookies, but I’m not going to lie and say they are my favorite. 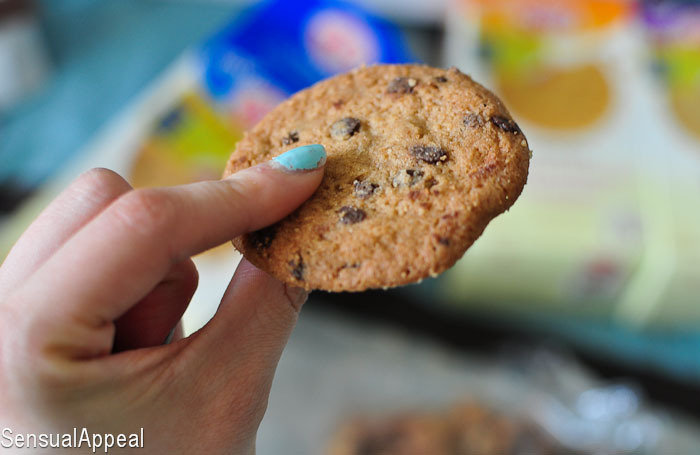 I much prefer chewy cookies to crunchy cookies and I doubt that will ever change. So call me biased, but that’s the way it is in my world haha. If you like crunchy cookies, if you like that texture, then you should most definitely try these, I am sure you won’t be disappointed. 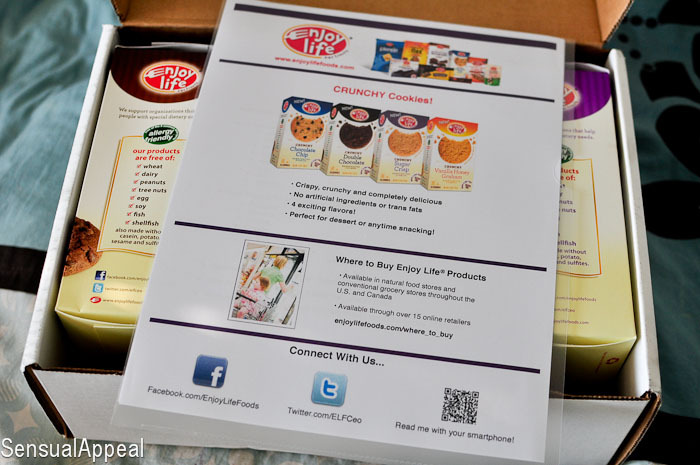 Enjoy Life products are available in natural food stores and conventional grocery stores throughout the US and Canada. You can check a full list of stores that carry them here. Make sure you follow the company on Twitter and like them on Facebook! Or check out another product of theirs that I reviewed and absolutely LOVED: double chocolate crunch granola (oh my gosh, SO good!!! I’ve been using it in everything, all my parfaits and frozen desserts) and their semi-sweet vegan chocolate chunks HERE. I had no idea there was a Chocolate Day! Well I must have known somewhere deep inside me because for the first time in a long time I made a chocolate banana smoothie for breakfast. Go me! I was just chatting with a friend about how nice it is to have recommendations for Gluten-free.. it’s expensive to buy a package of cookies and then find out they taste terrible! Thanks for the recommendations today!! No problem, Smidge 🙂 That’s part of the beauty of subscribing to bloggers isn’t it? I always love finding out about new products and seeing what other people think of them. I want to win, I want to win, I want to win! When are winners announced again?